Do you love creating high-quality product reviews on social media? 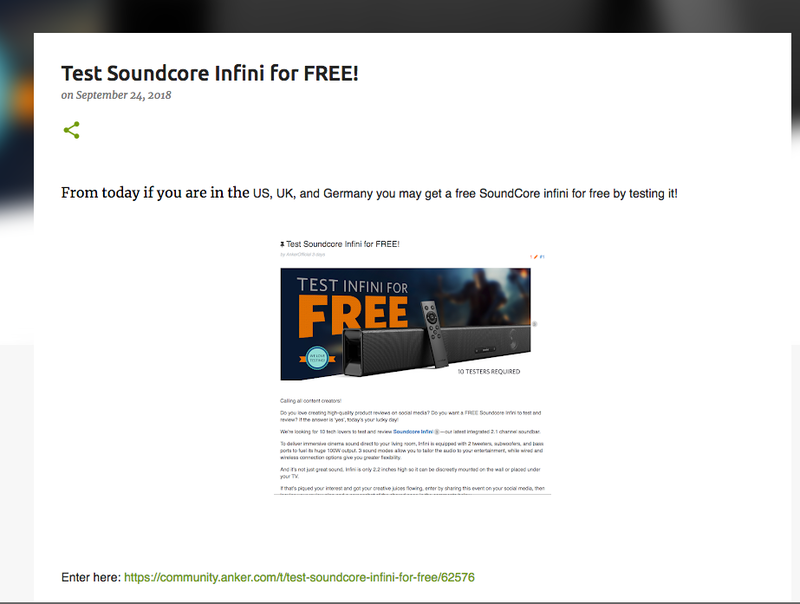 Do you want a FREE Soundcore Infini to test and review? If the answer is ‘yes’, today’s your lucky day! We’re looking for 10 tech lovers to test and review Soundcore Infini—our latest integrated 2.1 channel soundbar. To deliver immersive cinema sound direct to your living room, Infini is equipped with 2 tweeters, subwoofers, and bass ports to fuel its huge 100W output. 3 sound modes allow you to tailor the audio to your entertainment, while wired and wireless connection options give you greater flexibility. And it’s not just great sound, Infini is only 2.2 inches high so it can be discreetly mounted on the wall or placed under your TV. If that’s piqued your interest and got your creative juices flowing, enter by sharing this event on your social media, then leaving your review plan and a screenshot of the shared page in the comments below. We will pick the 10 users with the best review plans to win a FREE Soundcore Infini. If you have made high-quality reviews in the past or are an influencer, feel free to let us know so we can take your experience into account. Share this event on your Facebook or Twitter and leave your review plan for Soundcore Infini in the comments below with a screenshot of your the shared event on your social media. Each participant will earn 100 PowerBucks just for entering this event. This event runs from September 24th to October 5th, 2018. The winners will be announced on the community on October 8th, 2018. Only open to the US, UK, and Germany. Review Requirements: Once you have received your product, you need to send us a link to your review within two weeks. If you haven’t provided a link after two weeks you will be unable to take part in future We Love Testing programs. 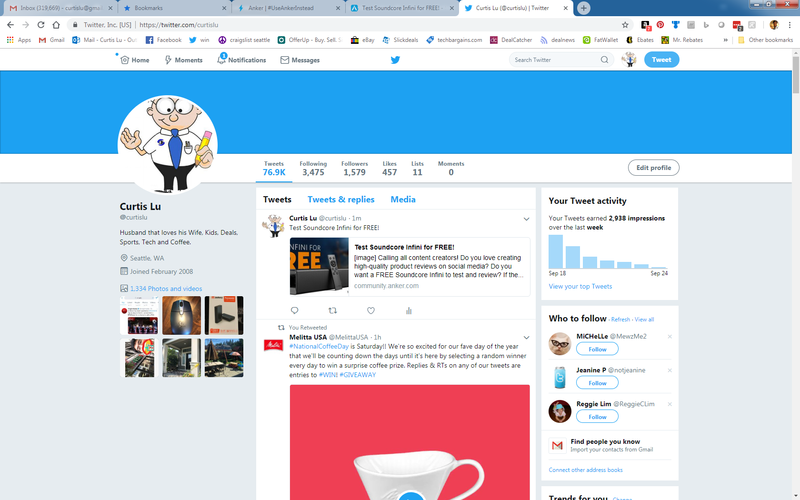 Where to share your review: You are not required to post your review to a specific website, but you could share your review on social media (Facebook, Twitter, Instagram etc. ), YouTube, community, blogs, deal websites, or other online spaces. 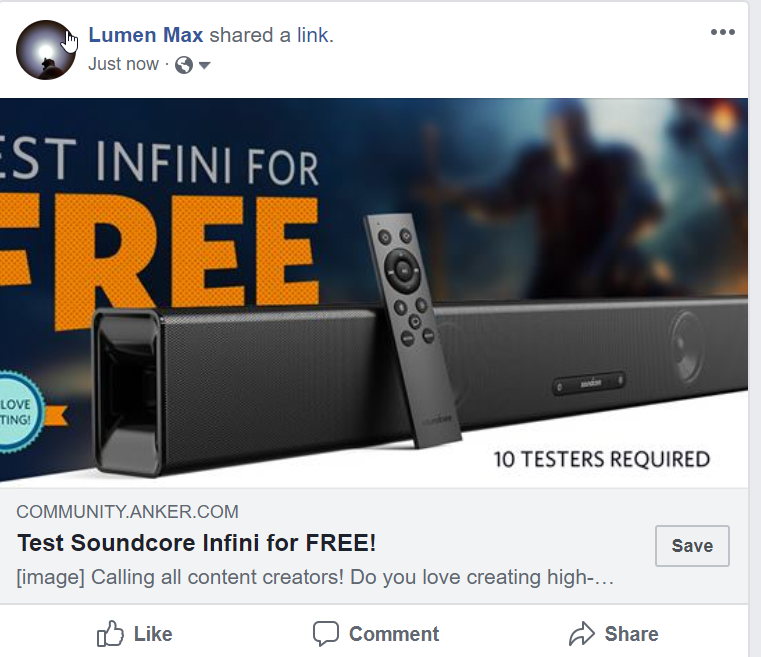 Winner Announcement | Test Soundcore Infini for FREE! 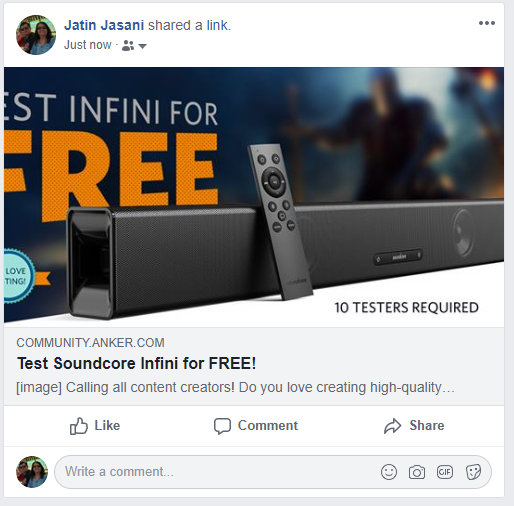 Thank you all for taking part in the recent Soundcore Infini We Love Testing event. I was really impressed by how professional and creative your testing plans were—our community is lucky to have so many great content creators! All the winners will receive a confirmation email this week. 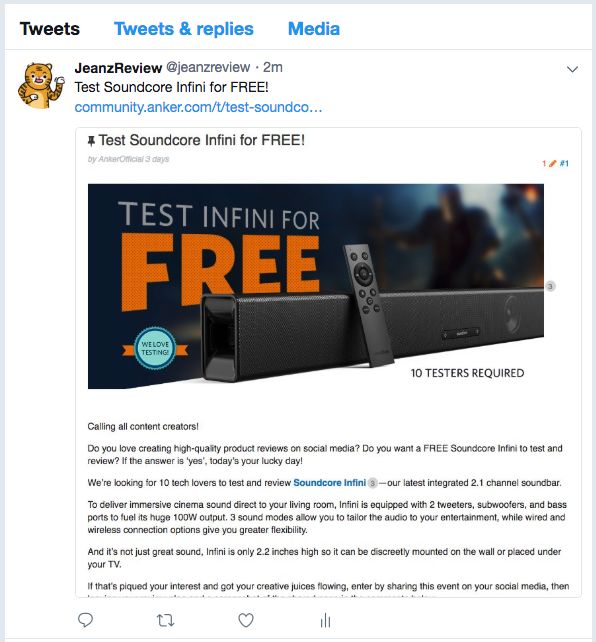 After you receive your Soundcore Infini, please send @AnkerOfficial a link to your review within two weeks. Sweet, I would love to be able to test this one out. My plan is to test and review the soundbar on 2 separate videos as broken down below. I would post my video reviews on my YouTube channel, as well as Facebook and Twitter.Thank Anker for another awesome review contest!! Test a few music categories from classical to EDM. Do a splash test. Just kidding. If chosen, my review would include the unboxing, setup, comparing the sound with & without the Infini, and testing the sound of different inputs & programming (sports, movies, music, etc). The reason I want to product test this, is because I'm fed up of not being able to enjoy TV, plus I got new films to watch. It's bad enough the TV takes 5 mins to turn on as standby will turn off, but takes ages to turn back on. Step 2, Sit down n take pain killers from jumping around! Step 5, Photo unboxing, with comments. Step 9, keep smiling, as I can listen to TV without straining, and asking for Jane... What they say? Test it stand alone with phone with music. Excellent event @AnkerOfficial think you will get some awesome reviews from community members. This is right in my wheel house as I currently have the Infini Mini. - Run it as a comparison against the Infini Mini as well as a 2.1ch Dolby Atmos/DTS:X soundbar with sub. I have a 70" LG TV, and purchased a Sonus Beam to use with it. My plan would be to test this as compared to the Beam for us watching Concert videos as well as action movies. And also compare to an existing 5.1 setup with amplifier and subwoofer that's setup on same TV system. And have i mentioned - I LOVE ANKER! Document unboxing and setup of the soundbar. Compare physical dimensions to other devices. Report back finding in an unbiased, subjective point of view. If picked, I would make sure test it out thoroughly: I have a VIZIO 32" TV , which I know thoroughly all ready and would be willing to invest in my own camera to record this as well. I would like to review your Soundcore infini. I will post on my Twitter and you tube channels. I plan to test this with my Visio M-Series TV in my living room, it is a big hall so will be able to test the sound quality and depth of the sound. This TV has optical output, so intend to connect via this input, to the Soundbar. Will be placing the soundbar right next to the TV, below the TV screen and check the sound depth. Hope to experience the Cinematic sound while watching movies. Also stream from my iPhone and S8 devices, so playout using the Bluetooth link. 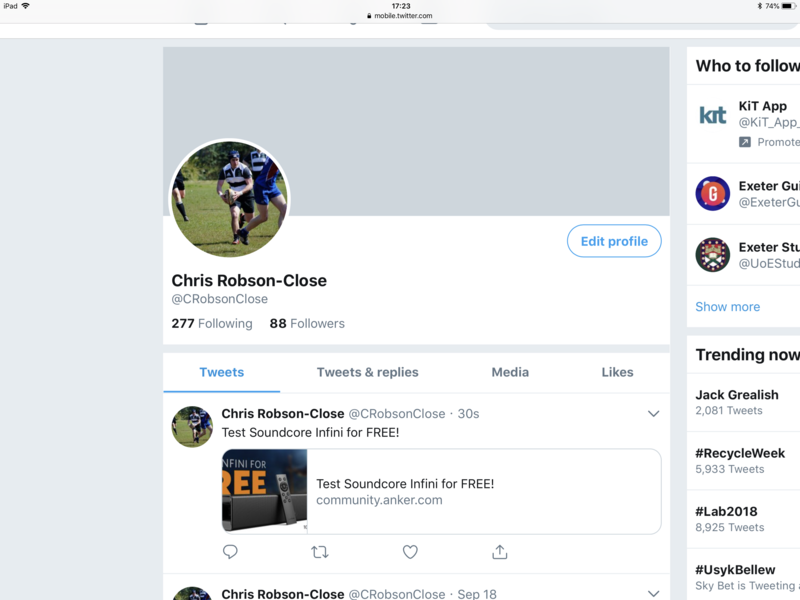 Most importantly I would compare this device with the two sound bars (one Bose & one Sony) that I have access to, in all of the above areas, and create a conclusion of my findings from the results. Exciting product with great features. 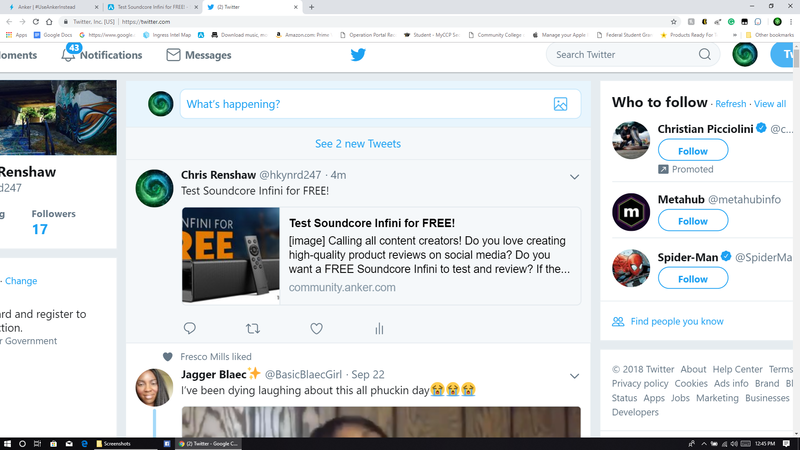 I plan to test this connecting to different sound sources like TV, Alexa, laptop mac etc for different sound types cinema, gaming, live recording play, youtube..... etc. Hook it up. I’ll take some pics from the unboxing, test with my Samsung un65f8000, connect my phone to it, stream to it from computer. Review it on Amazon!